“Filling in the cupcake” should be an expression in the same vein as “icing on the cake.” Both are added bonuses that you don’t need, but can take a treat to the next level. Icing is a bit more common than filling and since it may not be something you do every time you bake, I put together this photo tutorial to give you an edge the next time you give it a try – like if you decide to go for a batch of Devil’s Food Cupcakes with Vanilla Cream Filling, for instance. There are several ways to fill a cupcake with jam, cream or some other type of filling. The easiest involves cutting the cupcake in half and spreading it with the filling, treating the cupcake as though it were a tiny layer cake. It is effective, but doesn’t give you the classic “look” of filled cupcake. A slightly more sophisticated way is to put your filling into a pastry bag fitted with a metal or plastic tip, poke the tip into the center of the cake, and squeeze in a bit of filling. This method is quick, but tends to leave only a small amount of filling in place. 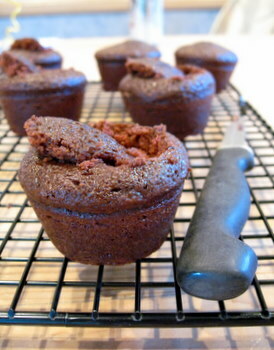 My favorite way – and, in my opinion, the best way – is the method I used for the Devil’s Food Cupcakes. 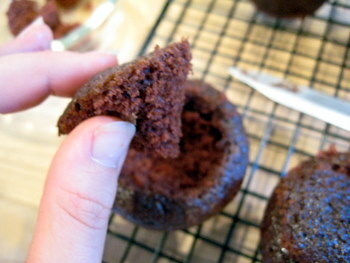 It gives you the maximum amount of filling and the best overall look for the cupcake. All you need is a paring knife, or other small, sharp knife with a narrow blade, to begin. 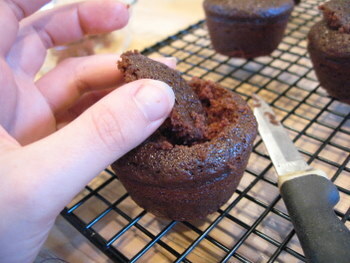 Insert the knife into a cooled cupcake at an angle, halfway between the center and the outside edge. 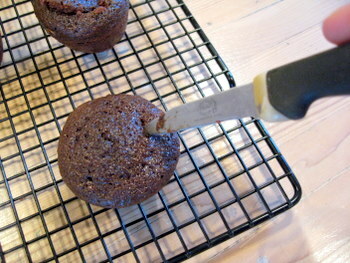 The exact angle isn’t crucial, but it should be around 45 deg., and the knife should go into the cake about 1″. The idea here is to cut out a circular cone of cake. Once you have your cone of cake, remove it and slice off the pointy end of the cone, leaving just the circular base (which was the very top of the cupcake). The filling will be put in the hole once filled by the cake cone, and the circular piece will be used as a plug to seal the filling in. Filling should be added using a pastry bag or (my favorite) a ziploc bag with the corner cut off. 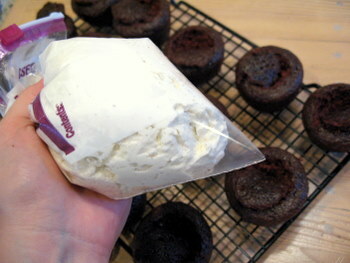 There is no need to use a pastry tip to fill the cupcakes; a medium-sized opening in either type of bag will make filling the cakes a breeze. Once the filling is in place, just pop the flat circle of cake back into place and continue to frost as you would with any other cupcake. You can see what the finished cake, sliced in half to reveal the cream filling, looks like here. Can you rehydrate a dried vanilla bean? 43rd Annual Pillsbury Bake Off Winners! The bonus of the cone method is that you get a little pile of cupcake middles to snack on when you’re done! Thanks for the instructions; I’m not much of a baker, and I’ve always wondered how to do this. great! i was just about to comment on how you filled it up. I’ve had very good luck filling cupcakes without making a cut. I put the filling into a Wilton electric cookie gun with a large star tip. Shove the tip into the cupcake and squirt. Stop when the cupcake starts to bulge. I think a normal cookie gun (like you use for spritz cookies) would work fine as long as it has a nozzle star tip. My favorites are yellow cupcakes, filled with creme and topped with chocolate ganache. Mini Boston Creme Pies! LinC – I’ve used that method as well and, while it is a bit easier, I think you can get a lot more filling into the cupcake this way. Plus, since there is more filling, less will be absorbed by the cake as it sits – which is nice when you’re not going to eat the whole batch in a day. Great illustrations. Thanks for the ideas! I use a apple corer to make a nice hole with even sides but I think this way gives more filling so I think I will try it next time. Can I fill cupcakes and then freeze them? Thanks for the tips!!!! I used them to make raspberry filled cupcakes, and they turned out great! Wilton makes a pastry tip for fillings. It’s about $2.50. 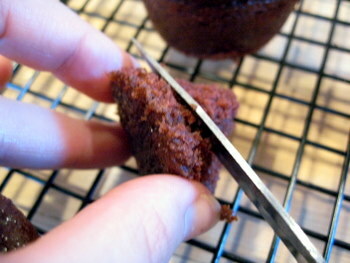 It’s very long and you stab it into the center of the cupcake and squeeze. If your going to do alot of cupcakes, invest in a Wilton 12 piece cupcake decorating set. It comes with 4 tips, 8 bags and instructions. The tip for putting the creme inside the cupcakes is the Bismark Tip. That’s Tip 230. 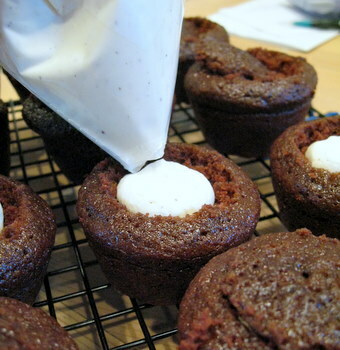 I use a Marshmallow Creme Filling, then use the 1M tip for making a Swirl on top of cupcake. There is a pan that you can by called the cupcake genius that comes with a rack that you sit on top of the cupcakes while they bake. It bakes a hole into the center of the cupcake. It saves the time of cutting out all of the holes, and it makes it so that the inside is filled and you get a little bit of filling in each bite. This is a great post! I’d love to republish it on my blog!! I used this technique and it turned out great! ThankS every one can’t wait to give this a try!! Beats paying $38 dollars a dozen at the upscale cupcake stores!!!! For some reason, though-perhaps because I have an appointment and haven’t worn out my welcome yet-I get taken to an inner office where a young woman interviews me absentmindedly. We also control the number of butter pats our customers get and the amount of sour cream on their baked potatoes. Do I dare engage in some major time theft? And how can I get out without Isabelle noticing? She’s already caught me folding the jeans the wrong way -you do them in thirds, with the ankles on the inside, not on the outside-and has come by to check a second time. These are great but I have had great success fillling a bundt cake too. (also, suggest adding strong coffee for a portion of the water). mmmmm good. just started baking cupcakes! could you share some suggestions for really good fillings? thanks much. I have hot cupcakes sitting on the counter and I own those big Wilton tips, but this way seems better, plus the little pieces will be fun to let the kiddos eat. I did white cake with strawberry filling…here’s how I made a great filling-one can strawberry pie filling, extra 1/4 cup sugar, 1T lemon juice, 1/4 teasp citric acid(to make it more tart)….put it in a big glass bowl and used a mixer on high to destroy the big strawberries, then heated in the microwave for 4 minutes, stirring it twice during heating. Let it cool, and now it’s ready for filling! Covering with white frosting and strawberry slices!, with a green curlyQ with a tiny writing tip! Ok. I read all comments. Isn’t the internet soooo amazing!! Anyway, making cupcakes for my baby girls 2nd bday for 17 kids and 27 adults!!! (yes…I am crazy!) could I use pudding as a filling or the canned lemon pie filling? Never done this before. Please help!!! Thanks! Yes…great comments. I just bought the Wilton tip today and think I will use it to fill my cupcakes with strawberry jam. Several times lately I have made strawberry and white cake swirl cupcakes and they have been a hit. For this event, I was going to add strawberry jam to the buttercream icing but afraid the flavor would get lost so I think I will go with the filling process. I wonder if any other amateur bakers have been inspired by Cupcake Wars on Food Network:) I have been!! Turtles and Peanut Butter : Hello, Baker! Awesome news and strawberry cupcakes! « PANDAS AND CUPCAKES! Our Share of the Harvest · She made a Raspberry Puree..